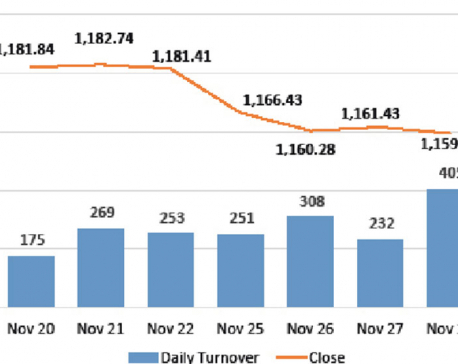 KATHMANDU, Nov 13: Weakness prevailed in the market on the second trading day of the week as the Nepal Stock Exchange (Nepse) index plunged to the lowest level since early September. The index shed 13.03 points to settle at 1,192.75 points on Monday. Monday's trading session was also marked by intermittent glitches in Nepse's official website, preventing investors from active participation. Nonetheless, market activity improved slightly, logging total turnover of Rs 133 million compared to Rs 99 million in the session earlier. Sectoral performance indicates most of the traded sectors following the broader market. Only Finance sub-index edged 0.07 percent higher. Insurance stocks turned in some of the worst performances of the day as sub-indices of Non-Life Insurance and Life Insurance segments sank 1.82 percent and 1.69 percent, respectively. Further, Microfinance, Hydropower and 'Others' stocks also struggled with their respective sub-indices shedding over 1 percent each. Meanwhile, Banking sub-index went down by 0.95 percent. In terms of market activity, Prabhu Bank Ltd logged the highest turnover of over Rs 12 million. Next on the list was Standard Chartered Bank Ltd which saw Rs 5 million worth of its shares change hands. Nepal Bank Ltd, Kumari Bank Ltd and Nepal Bangladesh Bank Ltd were among other actives with turnover of over Rs 4.72 million, Rs 4 million and Rs 3.86 million, respectively. Mutual fund units of Nabil Equity Fund led the list of advances as its unit price rose by 2 percent. Oriental Hotels Ltd also added almost 2 percent on its share price. Similarly, Nagbeli Laghubitta Bikas Bank Ltd gained 1.90 percent following the micro-sector lender's announcement to distribute 16.11 percent bonus shares to its shareholders. 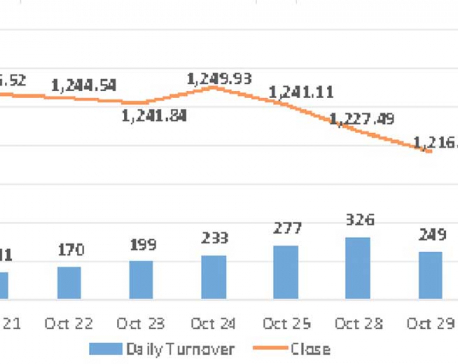 Other top gaining scrips include Shrijana Finance Ltd, Rairang Hydropower Development Company Ltd and Kisan Microfinance Bittiya Sanstha Ltd.
Api Power Company Ltd led the losing pack as its share price hit negative circuit of 10 percent for the second straight day. Similarly, Arambha Microfinance Bittiya Sanstha Ltd also continued to tumble, dropping more than 8 percent on Monday. Furthermore, shares of Mirmire Laghubitta Bittiya Sanstha Ltd, United Insurance Company Ltd and Civil Laghubitta Bittiya Sanstha Ltd closed over 5 percent lower each. Forward Community Microfinance Bittiya Sanstha Ltd also shed over 5 percent despite the microfinance reporting a decent 18.57 percent year-on-year growth in its net profit as per its earnings report for the first quarter of Fiscal Year 2018/19. Among other companies publishing their financial report, National Hydropower Company Ltd and Vijaya Laghubitta Bittiya Sanstha Ltd posted net profit growth, while Best Finance Company Ltd and Radhi Bidyut Company Ltd reported significant decline in their earnings. ARKS technical analysis indicates the market stretching its losing run with a formation of another bearish candlestick on the daily timeframe. Subsequently, the index breached its support of 1,200-points level, making its downfall toward 1,100 points zone more plausible. With Relative Strength Index (RSI) tilted southbound and Moving Average Convergence Divergence (MACD) trending in the negative territory, the momentum remains in favor of bears in the current juncture.